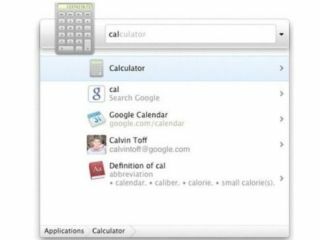 Google has unveiled its 'Quick Search Box' for Mac, offering Search functionality on your computer and fast actions for the results. Google Desktop for Mac has been around for two years, but Google has now added huge new functionality by displaying blended results from files, programs and your browsing history. However, the key move from Google is the addition of action functionality for the results. As Google explains: "Once you've found the result you want, we wanted you to be able to DO something with it." "To find out what you can do, select a result and press the tab key or the right arrow on the keyboard," the blog post adds. "Some examples of actions include instant messaging friends, playing a song, or emailing a URL. "Just like the data you can search over, the list of actions you can perform will grow over time!" Google is also making the tool extensible, encouraging third party add-ons to make use of the data.